alaTest a collecté et analysé 24 avis de consommateurs et d'experts pour le produit Dell Venue 10 7000. La note moyenne du produit est 3.6 sur 5, tandis que les autres produits de même catégorie ont une note moyenne de 4.3 sur 5. Les testeurs apprécient la batterie. La performance impressionne, mais de nombreux avis ont des doutes sur le rapport qualité/prix. En moyenne, les consommateurs notent ce produit 72/100 et les experts notent ce produit 71/100. The Dell Venue 10 7000 with keyboard is the most productive Android tablet we've reviewed, but don't throw away your laptop yet. 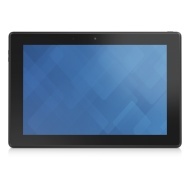 The Dell Venue 10 7000 is a sleek tablet-hybrid with a sturdy Bluetooth keyboard. Performance is swift and smooth, and it runs on the Android Lollipop 5.0 operating system. It also features a stunningly sharp screen and nifty depth-sensing cameras. It's a bit heavy and expensive. The small keyboard can feel cramped to type on. The refined build quality and slick performance of the Dell Venue 10 7000 make it one of the finest Android tablet-hybrids around. Sharp, vibrant display. Unique, well-executed design. Sleek keyboard accessory. Overpriced. Some performance hiccups. Keyboard must be bought separately. Dell's Venue 10 7000 tablet has the same good looks as its smaller sibling and offers a detachable keyboard, but its battery life and screen brightness don't measure up. The Dell Venue 10 7000 is a great tablet that wants to get to work, but it's lacking in the memory department to deal with multitasking. Coupled with the optional keyboard, our Dell Venue 10 7000 review takes a look at this 10.5" tablet that doubles nicely as an extremely portable Android "laptop" solution. Design, battery life, Intel® RealSense™ Depth Camera an interesting feature. Price is a bit on the expensive side for the fully upgraded version. The Dell Venue 10 7000 is a great Android “laptop” solution, albeit a bit on the pricey side. Solid build, great battery life, and the optional keyboard make for a great 10.5″ Android tablet.